We feature a quality selection of fashionable eyeglasses and premium lenses. Serving the Surrey area, our office is conveniently located at 103A-19151 Fraser Hwy, Surrey, BC, V3S 8E7, so it’s easy to stop by and benefit from our exceptional vision products. All patients, new and returning, are treated with patience and no pressure to reach a hasty decision. Superior customer service is our goal, and we want you to be thrilled with your eyewear and your experience in our Surrey office! Driven by a passion for innovation and development, Hoya Vision is constantly moving boundaries. By use of extensive research and cutting-edge technology, Hoya provides tailored optimized experiences – both for the eye care professional and the spectacle wearer. Lens making is a delicate process. It depends, to a large extent, on the technological skills and knowledge of the manufacturer. Even the smallest error can have a major impact on your customers' quality of vision. 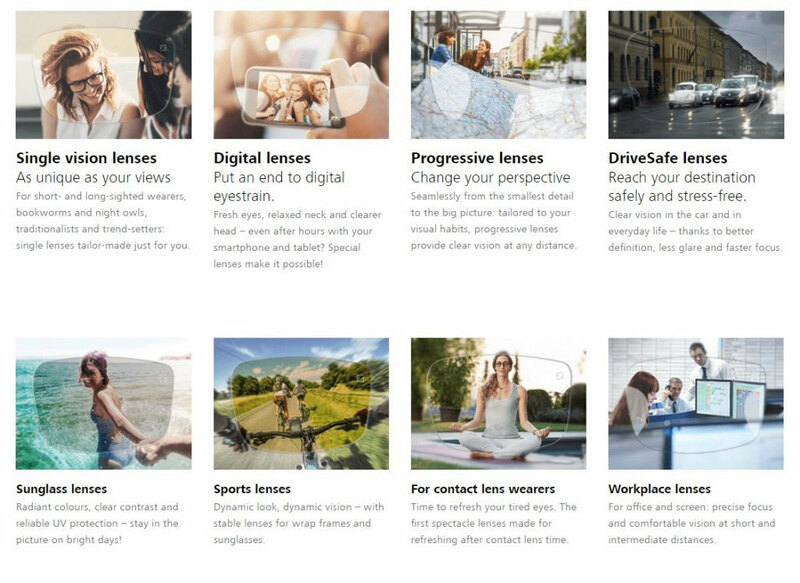 Hoya develops their lens technology to support opticians who want to be sure they are selling the highest quality products and wearers who desire clear, comfortable vision at all times. All Hoya's lenses are produced with freeform surfacing. The main benefit of this lens technology is that we can consider the lens surface as a series of individual points. They then cut each of these points – at the pixel level – along multiple axes. Such precision means that we can optimize each lens for every prescription. They can even incorporate frame, fitting and wearing parameters into the lens calculation. The result is a highly personalized lens, every time. By selecting Hoya Vision lenses, you can be confident that you are wearing a state-of-the-art product resulting from a wealth of knowledge and experience. Put simply, Hoya provides you with the best possible technology solutions to support you with a unique premium product range that sets you apart. Then you may have presbyopia, a common change in eyesight that typically affects people over the age of 40, and progressive lenses could be the solution for you. Progressive lenses have a gradual curvature across the lens surface and provide not only clearer vision at near and far distances but also smooth, comfortable progression in between. The introduction of Hoyalux iD, since renamed Hoyalux iD InStyle, revolutionized the premium multifocal sector. All the benefits in one integrated design. With traditional progressive lenses, the back surface is progressive while the front surface holds the prescription power - or vice versa. This means a choice has to be made between a fast interaction between far and near in combination with a narrow near segment or having a wide near segment that results in a long corridor length. In Hoyalux iD InStyle, the addition is split into horizontal and vertical progressive components, that are placed in the best position in relation to the eye. Because of this unique structure, Hoyalux iD InStyle integrates the best of both worlds: A wide, distortion-free field of vision at all distances and fast interaction between far and near. Hoyalux iD InStyle ensures easy adaptation and guarantees a truly comfortable, and balanced visual experience. Hoyalux iD LifeStyle V+ is Hoya’s progressive lens design that we can entirely dedicate to the feedback that came from you. Maybe even without knowing it, you gave us important information through your ordering behavior and data input in the MyStyle iDentifier. Wearer analysis and direct customer feedback through wearing tests, clinical trials and consumer research have also added to insights on the visual needs of modern presbyopes. Together with a freeform aspherisation process and design calculation technology Hoyalux iD LifeStyle V+ clearly is the result of people-based innovation. An important conclusion we drew from wearer analysis and order data is that one design for all does not work. Hoyalux iD MyStyle, therefore, was a major source of inspiration for Hoya in the development of Hoyalux iD LifeStyle V+. This led to two design variations that will help you meet the individual visual requirements of your target group to an even greater extent. For those who primarily focus on objects and tasks no more than an arm's length away. Harmony lenses are designed for those who already wear progressive lenses, and are having additional difficulty seeing close up. Tact Lenses are made specifically for those who work in front of a computer for many hours a day. They help with eyestrain and other symptoms associated with computer vision syndrome by helping you focus more clearly on the screen. The way human beings see the world has changed dramatically in recent years. Our viewing ranges have gone from distant horizons to intermediate zones, to now primarily focusing on near-tasks. Most of us simply don’t realize the harmful effects this shift has had on our vision and our overall health. The revolutionary design of SYNC lenses allows you to focus on all directions and distances – while your eyes remain relaxed – all day long. Not only does this alleviate eyestrain, it significantly reduces fatigue caused by our every day near task routines. Traditional computer screens are giving way to ever-smaller displays on tablets, eReaders, netbooks and smartphones. So now when we’re texting, tweeting, surfing, blogging, emailing, or playing, we’re putting more pressure than ever on our eyes. HOYA’s Super Hi Vision EX3 coating provides twice the scratch resistance of any AR coating available while maximizing light to the eye to optimize sight. The result is a more durable lens with minimal glare. Super Hi Vision EX3 also features an improved hydrophobic layer, providing a finish that resists smudges, fingerprints, dirt, and water for a clear view of any condition. The many benefits of a good anti-reflective coating can be ruined by scratches. RECHARGE is a premium lens coating developed to protect your eyes from damaging blue light wavelengths while allowing you to enjoy your favorite media devices. A lens treatment with a measure of health protection. Blue light in itself is a natural phenomenon, it is present in daylight and helps us to stay awake, however, excessive amounts can have an adverse effect on our eye health. Our exposure to this High Energy Visible Light (HEVL) grows with the use of LCD and LED computer and television screens, smartphones, tablets and GPS devices. If your visual tasks are based predominantly around near or intermediate distance, standard progressives may not be the perfect solution. Hoya Vision indoor lenses are specifically designed for you who demand crystal-clear vision at work or when completing detailed tasks in close proximity. Actually, treating lenses is like icing a cake. Hoya Vision’s lens treatments are bonded to the surface of the lens or incorporated into the lens during the manufacturing process for maximum durability. You can opt for a single anti-reflective coating or a combination of several lens treatments. Depending on your needs and preferences, different types of lens treatments will make the lens perfectly suited to you. Have you ever considered prescription sunglasses? There’s no need for them if you choose photochromic lenses because they change tint according to the light conditions. In strong sunlight, your spectacles work as sunglasses. Indoors, they are your normal clear spectacles. If you don’t want to carry extra glasses or dislike constant switching, then photochromic lenses are for you. Sun protection, glare reduction and contrast-rich vision are important for the active outdoors wearer. Hoya Vision offers a range of tinted lenses that reduce glare and enhance contrast, even in challenging weather conditions. With dozens of options to choose from, there is no need to compromise fashion for function.